Take a look at the 2014 Preseason Chris Rubio Award Long Snapper Watch List! The Chris Rubio Award recognizes the top high school Long Snapper of the Year. Past winners of the Chris Rubio Award are Scott Daly (Notre Dame), Cole Mazza (Alabama) and Blake Ferguson (LSU commit). The players on the Watch List were selected based on their showing from the 2013 season and 2014 season expectations. The eventual winner does NOT have to be on the Watch List to win the awards. Good sized Long Snapper with a great ball. Always improving. One of the smoothest Long Snappers in the country. Oregon St. offer. Might have the fastest snap in the country. Tight spiral and great attitude. Phenomenal frame on this exceptionally smooth Long Snapper. Extremely strong Long Snapper that can play at the next level right now. 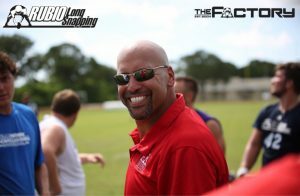 Always improving Long Snapper with an excellent frame and attitude. Tremendous size on this midwest Long Snapper with a solid ball. Semi-Finalists will be announced in early November. The three Finalists will be announced in early December. The winner will be announced on January 16, 2015 at the Awards Ceremony in Las Vegas, NV. What is your favorite motivational quote? Hard work beats talent when talent doesn’t work hard. What makes YOU the best Long Snapper in the country? My work ethic and my attitude towards adversity. What is one unique quality about you that not everyone might know about? I have a twin brother that looks nothing like me. What is your favorite motivational quote? Dream big and dare to fail. What makes YOU the best Long Snapper in the country? My work ethic and drive. What is one unique quality about you that not everyone might know about? I have a twin. What is one unique quality about you that not everyone might know about? What makes YOU the best Long Snapper in the country? My speed and accuracy and now finally my consistency makes me the best long snapper in the country. What is one unique quality about you that not everyone might know about?My pediatrician diagnosed me with failure to thrive when I was 1 and 2 years old. What makes YOU the best Long Snapper in the country? 1) I’ve known Rubio since I was 12; 2) I have been an athlete my entire life and have excelled at several different sports. Through my many years of playing on all sides of the ball, especially on defense, I have developed not only a physical, but a mental toughness. I snap fast, I can block, I like to hit & tackle and I’m fast enough to get down field and stop the returner; 3) I am seen as a leader by my teachers, coaches & peers and I do well academically. What is one unique quality about you that not everyone might know about? I am going to be balder than Rubio. Quote: Hard work beats talent when talent doesn’t work hard. What makes you the Best Long Snapper? I love my family and I know they are a crucial part of who I am and my success. I drive myself hard on and off the field. I have worked very hard to master my craft of long snapping and incorporating that into my athleticism. I am very humble and appreciate those that have taken an interest in me and my future. 3. Hanging out with friends. What makes YOU the best Long Snapper in the country? The will and determination to be the best I can be. What is one unique quality about you that not everyone might know about? I learned to juggle in 2nd grade. What makes YOU the best Long Snapper in the country? Because I believe I am. What is one unique quality about you that not everyone might know about? I am currently involved in a 5 year Medical Research Study finding a cure for Type 1 Diabetes. What makes YOU the best Long Snapper in the country? My determination to be the best and willingness to work as hard as it takes to reach that. And my hair. What is one unique quality about you that not everyone might know about? I can eat more California burritos in one day than most people can in a week. What makes YOU the best Long Snapper in the country? High level of confidence, ability to understand feedback for improvement and passion to excel; all to better my team as a whole. What is one unique quality about you that not everyone might know about? I have a love for the Spanish language. What makes YOU the best Long Snapper in the country? My size athleticism and my love and understanding of the game. Believing in myself so much that every time I step on the football field I believe I can make a game changing play. What is one unique quality about you that not everyone might know about? People have said that I am really humble. Almost too humble. What makes YOU the best Long Snapper in the country? What makes me the best Long Snapper in the country is my work ethic, focus, and desire to succeed. I work hard everyday to improve and accomplish my goals. I am a radio commentator for high school baseball. What makes YOU the best Long Snapper in the country? I Work smart and everyone knows I Spit Hot fire! “When you feel like quitting remeber why you started”. The Amount of heart I have for not only long snapping but the game of football. What is your favorite food? -All. What makes YOU the best Long Snapper in the country? What makes me the best long snapper in the country is that I am an analytical thinker which enables me to continually perfect my craft to perfection. Also I’m diligent in the pursuit of perfection and striving to be the best at what I do, in everything I do. I am the best long snapper in the country because I know how hard I’ve worked, and I have CONFIDENCE in myself that I am the greatest. One unique quality everyone may not know about me is that I played Hockey for 12 years. What makes YOU the best Long Snapper in the country? I bring the best combination of snapping skill, blocking and tackling. What is one unique quality about you that not everyone might know about? I can out kick my kicker! What makes YOU the best Long Snapper in the country? I snap a fast, consistent, and smooth ball back to punter. My snaps are easy to catch and the punter can count on the ball being there every time. What is one unique quality about you that not everyone might know about? If I can’t be on the football field, I love to be out fishing or hunting. What is your favorite motivational quote? I can do all things through Christ who strengtheneth me. I have an eidetic memory and can quote from hundreds of episodes of Spongebob and the Big Bang Theory. I can quote almost the whole movie anchorman and know a song containing every country in the world, as well as one containing every element on the periodic table. I know countless facts that are completely useless in life and am able to recall objects, images, sounds, and occurrences with high precision and in great detail. I am hard working and very dedicated to play the game that I love. I truly put all of my effort and heart into whatever I do. I practice day and night and when people are watching me, I remain calm and I snap better under pressure. Most people crack under pressure. I do the best under pressure. What makes YOU the best Long Snapper in the country? LOCATION. LOCATION. LOCATION. What makes YOU the best Long Snapper in the country? The ability to execute my responsibilities as a long snapper, under the pressure of a huge gathering of spectators and through any amount of distraction makes me the best Long Snapper in the country. What is one unique quality about you that not everyone might know about? I enjoy using my creativity to build things like custom archery arrows, a personal closet workshop and whatever may come to mind. I also like using a little home brewed chemistry to concoct home made pyro-techniques. 2. Building and constructing things. 3. I love to help out around the community and do things to better it. Also love serving in the church. Definitely I am a steak and potatoes type of guy. I will never give up. I have the work ethic to keep going no matter the circumstance. I am always looking to improve and never settle on what just happens in the past. It is always about improvement with me. I have great character and a joy to be around. I always put my best effort forward and do it to the best of my ability. I am a leader and have the greatest and upmost character. Always telling the truth and I am a very kind person. My dedication to the game and my drive to make it to the next level. I have two different colored eyes. What makes YOU the best Long Snapper in the country? My ability to preform under any amount of pressure and deliver a perfect snap when needed. What makes YOU the best Long Snapper in the country? I will out work anyone else that you put me up against. Whether that’s in the weight room, on the field, or in just plain ole’ effort. I will out work anyone else. What is one unique quality about you that not everyone might know about? I am an avid Tai Chi student. In both mediation and in combat. My work ethic. I work harder than any guy in our class, and make sure everything is perfect. I’m a perfectionist. I am teddy bear at heart. I’m the nicest person you’ll ever meet. I don’t wish bad on anyone. What makes YOU the best Long Snapper in the country? In addition to excellent snapping, I have the athletic ability to cover punts. What is one unique quality about you that not everyone might know about? I taught myself to play piano. 2. Playing all different types of sports. 3. Spending time with my family. What makes YOU the best Long Snapper in the country? My work ethic is better than any long snapper out there! I will always outwork my opponents. What is one unique quality about you that not everyone might know about? I have a big heart and I’m willing to help anyone no matter who they are.